Swiss sailor Bernard Stamm says his IMOCA 60 race yacht broke in half and sank after being hit by a wave in the height of ‘Storm Dirk’. He has been speaking about his miraculous rescue earlier today, which saw him and his co-skipper Damien Guillou swimming for their lives in huge seas some 170 miles south-west of the Scilly Isles. The pair repeatedly had to enter the water in darkness during several attempts to airlift them and later to transfer to a 198m cargo ship. Miraculously, the pair managed to swim to the cargo ship in the nick of time as their broken up boat disappeared into the water behind them. Stamm activated his EPIRB yesterday evening after being dismasted. Air rescue attempts involving French and UK aircraft failed (see report here), but after several more very difficult rescue attempts the two were able to swim to a Norwegian cargo ship, Star Isfjord, which had been diverted by Falmouth MRCC to assist. “We were a little ahead of the front, downwind. There was a steady 43-45 knots [of wind], but it was manageable. We were prepared for this gale. We were under storm jib, with four reefs in the mainsail. Clearly, we really had the handbrake on, but in a wave the boat broke in two just behind the daggerboards. “The mast did not fall immediately. We quickly closed all boat bulkheads and the rig fell over the stern. Very quickly we asked for help and organised our survival plan. Speaking of the rescue operation, Stamm explained that Falcon 50 aircraft from the naval aviation base at Hyères arrived around 2330 after refuelling in Bordeaux. The air crew co-ordinated the rescue before being relieved by a maritime patrol aircraft around 0600. Meanwhile, a Sea King helicopter from the UK attempted an airlift. “He has asked us to put our liferaft in the water so that a diver could pick us up. That’s what we did, but Damien and I never managed to get away from the boat. It was too dangerous because of our broken bow. Finally, we had to go back aboard Cheminées Poujoulat leaving behind almost all of our water, grab bag, satellite phone and flares. In short, at this point, we had fired our big guns. “The rescuers told us to swim and they would try to pick us up directly from the water. Unfortunately, that did not work either. That was even worse, because I had a lot of trouble getting back on the boat. That was a big shock. The crew threw another rope, which Stamm was able to catch before the two sailors were thrown across the top of the coachroof. Guillou was able to swim to a lifebuoy thrown from the ship and grabbed hold of tbe boarding net, but Stamm was thrown into the water and reckons that he had to swim 80m, sometimes going under, until he succeeded in grabbing it. Stamm and Guillou were unlucky to be in exactly the wrong place at the wrong time. Stamm, whose round-the-world race yacht this is (he raced her in the 2012/3 Vendée Globe), had joined the boat in the Azores for the final stage of a long delivery back home from Brazil after completing the two-handed Transat Jacques Vabre race with Philippe Legros. 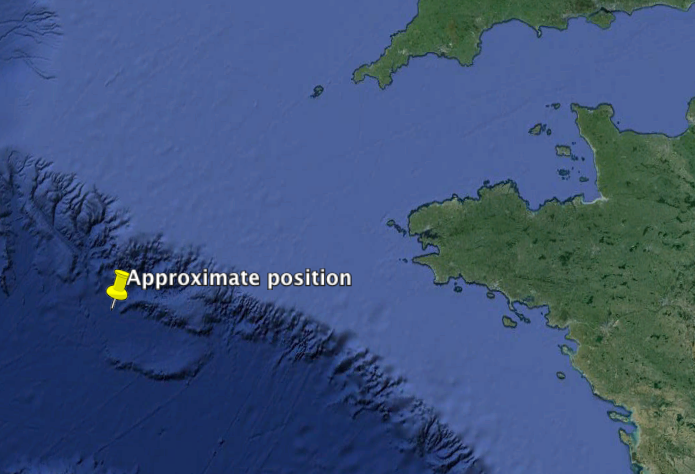 The very approximate position of the incident shown in the map below (the rescue took place 170 miles south-west of Scilly and 180 miles west of Brest) illustrates how ‘Storm Dirk’ hit them as they reached the edge of the continental shelf. This is a point where, even in relatively moderate conditions, the rapid shallowing of water stirs up an exaggerated sea state. A day earlier they had reported sailing in winds of 45-55 knots, very big seas but said they were holding up fine. ‘Hide the children and the cat, park your car away from trees; we are coming up with something not very nice,” they reported. Alarmingly, they added that they had been unable at times to slow the boat, which had hit a top speed of 31.3 knots, and had on several occasions been rolled in wave troughs. Stamm has previously had a number of other rescues and very close calls. To be quite fair, that is not unusual in this class, which sees sailors and their boats tackle some of the harshest ocean conditions in the world and routinely cover tens of thousands of miles a year (Stamm has raced over 35,000 miles in this boat since November last year). In 2011, Stamm and Jean Francois Cuzon were airlifted off this same Juan Kouyoumdjian-designed IMOCA 60 when the boat was holed close to the the waterline while racing north of the Azores during the last edition of the two-handed Transat Jacques Vabre race. 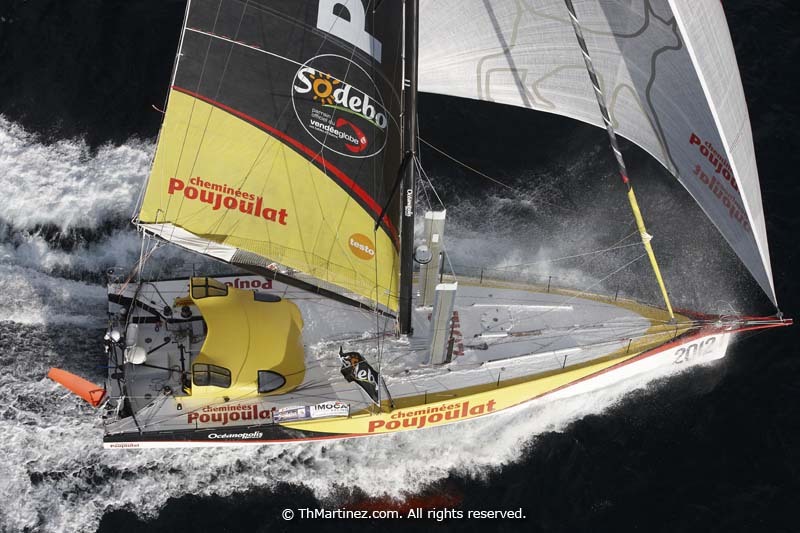 In the 2008/9 Vendée Globe race he suffered rudder damage to his earlier design IMOCA 60 Cheminées Poujoulat. He had anchored in the Kerguelen Islands to make repairs when the boat was driven ashore in high winds and very badly damaged. In the 2004 Transat single-handed race, Stamm’s first, self-built IMOCA 60, Cheminées Poujoulat-Armor Lux, capsized and he was evacuated by a tanker. Our thanks to Thierry Martinez for the photos of Stamm and his boat.